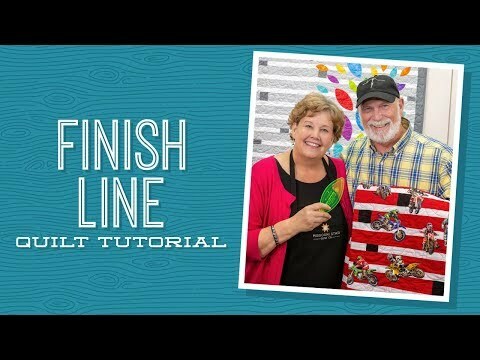 Finish Line Quilt Pattern by Missouri Star - Missouri Star Quilt Co. - Missouri Star Quilt Co. They say the key to winning is imagining yourself crossing the finish line even before you even begin. So, go ahead, picture yourself snuggling beneath this beautiful quilt and before you know it, you will be! The race begins with two simple rolls of white and gray 2 1/2" strips, but when you scatter an array of colorful orange peel shapes across the top, it really comes alive. Finish it all up with 3/4 yards of border fabric and you're a winner! Finished size: 52" x 75"
Quilt pattern for 1 1/2" and 2 1/2" strips.